Owning a cat means taking care of their grooming needs, including proper ear care. Learn how to tell the difference between cat mites and ear wax so you can make sure your cats are clean and comfortable. What Are Cat Ear Mites? Ear mites are tiny arthropods that infest your cat's ear canal. They feed on your cat and are very common in cats, particularly kittens and cats with compromised immune systems. They are also contagious to other cats as well as dogs. Your cat is constantly shaking and scratching his head. The inside of the ears are red and irritated. Skin outside and around the years may be inflamed. There is a wax buildup in the ears that has a dark black or brown color. The wax will have a noticeable unpleasant odor. There may be a dark discharge inside and coming out of the ears. Your cat may seem disoriented. Your cat will have a tilted head and flattened ears. The video below shows what ear mites look like in a cat's ears. What Is Cat Ear Wax? Most cats do not get wax in their ears, although it can happen. Often when you do see a dark and smelly wax buildup it indicates another condition, such as a yeast or fungal infection, ear mites, or other irritations in the ear. If your cat's ears look healthy with pale pink skin and some light brown wax, this is normal. Ear wax itself is normal in a cat, but if you see any of the above symptoms, such as head shaking and scratching, your cat may have ear mites. Wax in both normal cats and cats infected with mites is brown. The normal type of wax is a lighter brown color and does not give off an odor. The wax in a cat with ear mites is darker brown or black and is described as looking like coffee grounds. It also will smell bad. The reason the mite wax is darker is that it's mixed in with dried blood and skin from the damage the mites are doing to your cat's ears. If you see wax and the ears are also inflamed, this likely means mites. Wax in a pink or pale pink ear is probably not indicative of mites. It's important to check your cat's ears regularly for signs of a problem. 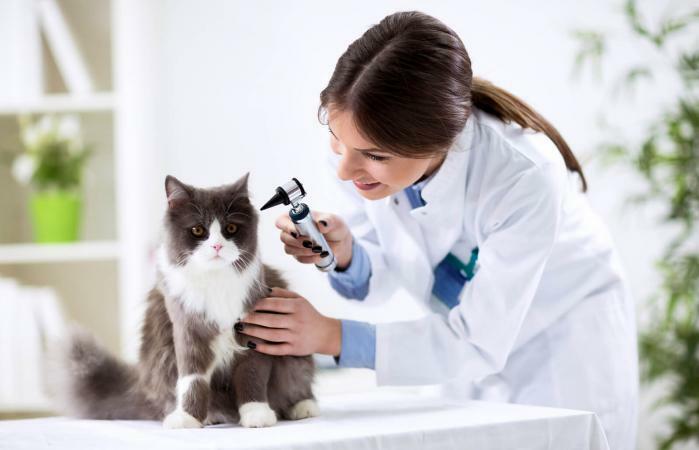 If you see any of the symptoms of ear mites, or are concerned with even normal wax, it's time to take your cat for a visit with your veterinarian for diagnosis and treatment. You can also try some simple home remedies for cats' ear mites.